Since the calculated value of schedule number is less than forty, then schedule 40 type of tube will be used. 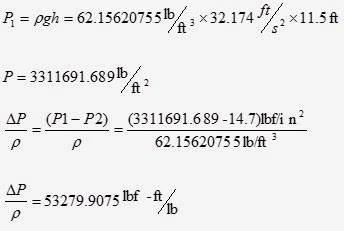 Since the Di calculated is 0.627967922 ft, the from Appendix C-6 of Foust the NPS is 0.75 in. In the piping system design calculation, the equation below is used because the equation is for incompressible fluid like tannery waste water. Refer to the tables of this appendix to compute for the pump power requirement between two or more equipment. The kinetic energy exhibited by the tannery waste water is calculated as shown. The compressibility factor, alpha is determined using the Reynolds number. Given the calculated Reynolds number, from Fig. 20-2 page 543 of Foust, locate the value of alpha. The alpha is equal to 0.87. The potential energy of the tannery waste water is calculated as well as shown. The pressure involved in the specified location in different equipment can be calculated using the hydrostatic pressure formula since the waste water is mostly composed of water. f is a function of Reynolds number and E/D. From Appendix C-1 page 540 of Foust, at Di=0.824in E/D=0.00056. From Appendix C-3 page 544 of Foust with Nre=253119.9664 and E/D=0.00056, f=0.02. 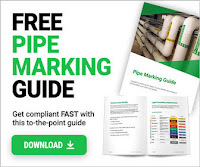 The length of the pipe used involves the straight pipes, fittings and valves. For Lfittings, one fitting between the two equipment is needed. The fitting chosen is the 90 standard elbow. For Lvalve, one fitting between the two equipment is needed. The valve used is the globe valve conventional with wings or pin guided disk fully open. Refer to Appendix C-2a page 542 for the literature value. Now, the friction factor can be calculated as shown. Power requirement of the pump that will be used to deliver the waste water from one equipment to another can now be calculated as shown below. Thanks for the info! I have also found a great P&ID Tutorial (Piping and Instrumentation Diagram) using Lucidchart and it is very easy to use! Check it out! Thanks for the info! I have also found a website that teaches What is P&ID? P&ID Definition and Meaning and it is very helpful and easy to use! Check out Lucidchart! Great article! I have also found some helpful P&ID Diagram Examples using Lucidchart and they are very easy to use! Give it a try!